I was a starry-eyed bride when I first moved to the boonies with my groom. It was late fall and all the summer people had left long ago. No one else lived within a radius of three kilometers and beyond that was a hermit. The two big social events of the week were the long snowshoe into town to get mail and supplies and to warm up by the pot-bellied stove at Robinson’s General Store, and again, to go to church on Sunday . Back then, a special cultural event was to have people over for dinner. It was a big operation to get them in our roller-coaster road in winter. Once they were there, the guests could never fully relax, either because they were so anxious about getting out again, especially if it was snowing, or because our cabin was uninsulated and the temperatures outside fluctuated between -30 and -40 C. The poor souls rarely took their coats off throughout the meal or afterward. In any case, besides entertaining, a cultural event was also a day-long snowshoe, a bonfire and picnic in the snow, or stargazing on our backs in the middle of the frozen lake while the wolves howled around us. Now, thirty years later, I am attending the 9’th annual wine and cheese cultural event of our hamlet. My, how things have changed in Dorset since the 80’s. While we sip our fruit wine, and look at original art of local artists (Yes, I am here with my paintings. ), local saxophone musicians, singers, poets, and writers entertain us. It’s all so smooth and urbane. I close my eyes to see if I can fool myself into thinking that I am really in downtown Toronto. It actually works for a few seconds. When I pop my eyes open again, I am happy to find myself sitting in the same old Dorset Rec Centre gym, beside Joanne again. Only now she’s all dressed up. Quite a transformation from this morning when we were here in our sweats doing downward dog side by side in the same spot. I like the overlap. There’s something real, and homey about bumping into each other over and over again in different contexts. Joanne’s also in my book club, my tai chi class, and my church. We can never become too proud or sophisticated or cultured because we have all seen each other in the undignified happy baby yoga pose and we know each others problems and have prayed together over them in church. While I still love the old cultural events that connect me to the land and to a simpler way of life in the bush, I enjoy the new, too, especially in my own little hamlet. I learn a lot. I am reminded that Joe, who works with me in the community garden, is one fantastic saxophone musician. Tina, whom I only ever see pushing the grocery cart around our general store, can write splendid poetry. I never noticed before what a great speaking voice Mary has until I listen to her as the MC of the whole cultural evening. She’s always quietly selling tickets for the Concert Association of Huntsville. It’s an manageable drive to Toronto to see the Picasso art exhibit, or to hear Yo Yo Ma play cello or Margaret Atwood speak whenever the need to see the greats presses. We’re not missing out on much. Up on the Canadian shield we give the everyday artists the stage. We cheer them on and watch them evolve. They are real people. Such a tiny hamlet has a lot of artistic talent and we get to have an evening of fun and discover a bit more about our community members at our annual Evening of Wine, Words, Music and Art. I don’t know if I would call today a good day or not. It was one of those days when all I can think about is a cup of coffee and a little nap under my feather duvet. Now, I’m supposed to be an artist. You know, an original thinker, a fount of imagination and of all things unusual But not today. The creativity switch just won’t turn on. Instead, I go to click the on button of my $15.00 Sally Ann stereo with a spastic volume dial that can unexpectedly jump up to full volume (over 50) if jiggled. I raced through the shop, back to my studio, where the other members of my book club stood, frozen in the overwhelming volume, and Harry was frantically spinning the useless volume dial while Beethoven’s symphony ripped. Julie wasn’t kidding when t\she said this was our hour of power. I chuckle at the memory, then decide that I will have silence today. I pull up a chair to the window and look to Tower Hill for help. “I will lift up mine eyes unto the hills from whence cometh my help“, I chant encouragingly. Today, no help cometh. Coffee time. Better take some to the guys in the shop, too. Back in my chair, coffee mug in hand, I watch sharp little spears of snow punish the garden that I just planted on Saturday and involuntarily pull the portable heater closer to me. About an hour into this non-creative crisis, I am definitely feeling the need of a nap. But the bed is a long, snowy, bike ride away.. So, I sit, practicing my yoga breath, and meditating. And that, cyber friends, is how I spent my whole morning in the studio. It sure doesn’t feel like I accomplished anything today. I did, however, notice how exquisite, how nourishing, the silence was. It had never occurred to me to paint elaborate designs on an egg. Eggs were for making puffy omeletttes and béchamel sauces. To me, egg painting was an old Ukranian tradition, kind of in the vein of painting entire landscapes on a grain of rice as the Japanese do. I just didn’t see the point of either. I am from Canada, where we like to make giant creations (giant goose, giant tomato, probably even a giant Ukranian egg somewhere on the prairies.) Besides, my paintbrushes were much bigger than an egg, which could never survive my exuberant brush strokes anyway. Even if it did, an egg painted by me would look as if a dog with purple saliva had licked it. But that was all before I met Jan Buley, the wife of my daughters’ piano teacher. I agreed to attend Jan’s Pysanky class, only because I was sure nobody would show up and I felt sorry for her. I even dragged a daughter or two with me. It was a small class in the basement of Sutherland Hall that early spring evening. I was nervous, because I hadn’t painted since the boys were born. I was convinced that I had flushed down any artistic talent while washing dirty diapers out in the toilet. Surely, I had rocked it away while comforting a wailing toddler. “Today we are honoured to have a special artist in our class today,” I heard Jan tell the class. “It will be interesting to see what extraordinary designs she comes up with.” When I realized that she was talking about me, I seized up completely. After a brief history of egg painting, Jan produced little wooden sticks with copper cones wedged into one end of them. She called them kistka pens. You scoop beeswax into the cone, then hold it over a flame until it melts, then draw your design onto a raw egg with the pointed end of the cone. The waxy lines dry instantly. Then you submerge the egg in a light value dye (like yellow). After rubbing the dyed egg dry, you draw more designs on the yellow with the beeswax, and then submerge the egg into another colour that is a bit darker (like, orange). Then you draw some more wax lines or shapes on the orange with your kistka pen , and then submerge it in a bit darker dye (crimson). You carry on the process until you finish with black. The fully painted egg is placed inside a toaster-oven, just long enough to melt the wax. You rub off the melted wax with a clean cloth and, voila, you’ve got a work of art on your egg. Only mine didn’t work. My “eggstraordinary” creation was an embarrassing, slobbery mess. But, my daughter painted an exquisite egg. For that reason, I bought the whole kit for us to try it again with my sisters, sons and nieces at Easter. That was over 10 years ago. Pysanky, which means “to write” now has become part of our annual, family Easter tradition. I’ve gotten a bit better at it since Jan’s class, even though my eggs are still sloppy. I love seeing how all the different, creative personalities come out in the egg designs. Jamie, who is marrying Gillian in a few weeks, wrote love notes to Gillian over his egg. Sarah’s and Emily’s eggs are perfect and exquisite miniature masterpieces. What I like is the happy, social time with my family as we chat and laugh and joke while we make art together around the big kitchen table. 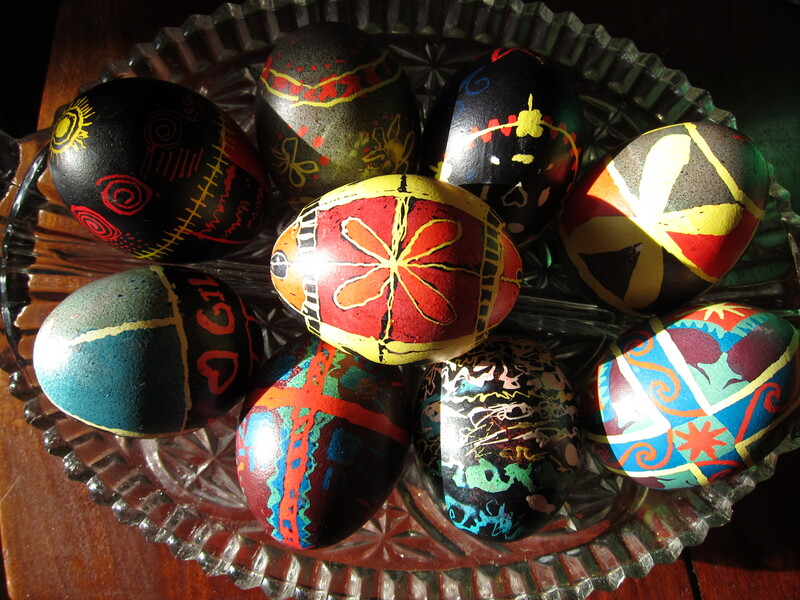 Traditionally, the Ukranians painted eggs to keep evil away. My family paints them to create art, fun and family togetherness. While painting is usually a solitary occupation, pysanky proves that it doesn’t have to be. I am very thankful to Jan for introducing me to this unusual but lovely tradition. Now that I come to think of it, Grandma Beer from the great Canadian frontier of Haliburton used to paint scenes on fungi that she broke off of tree trunks. Now, I wonder what the Ukranians would think of that? On the last day of March, my oldest son and I launched the canoe – an old, patched up discard that my husband and I bought from a canoe rental in Guelph, 30 years ago. The $400.00 we paid for it seemed like an astronomical amount, especially since what we got was a sun-bleached canoe with cigarette burns all over it. Rich cottagers on the Muskoka Lakes may have their antique cigar boats, but I have my rickety cigarette canoe and, believe me, it’s no less precious. So far, we’ve enjoyed 30 splendid years of canoeing in that faithful vessel and she’s still plying these northern waters, still tracking straight and true, despite the extra bit of duct tape patchwork. Never once has she dumped us, even with all those restless toddlers who would suddenly lurch over her gunnels to drag their curious, little fingers in the water. As we slide the decrepit canoe into the newly thawed lake, and gingerly lower ourselves onto the flimsy, wicker seats, we are extra careful not to put any weight on the paper thin floor. We don’t want to go through. There are still chunks of ice floating around in the lake. Did she survive another winter, we wonder? Any sign of a leak spouting out from under the duct tape? We watch anxiously for a few seconds, but, she holds together and soon we are swinging the bow around the end of the dock and heading exuberantly past the ice and out into the open water. I think of all the pristine lakes and serpentine rivers of Muskoka, Haliburton and Algonquin Park, over which our canoe has safely carried the family, to secluded places of astounding beauty, and of ear-pulsing silence. Those are the magical hideaways where the sky pierces through the dense, golden green foliage in little blobs of bright blue; where undisturbed, fallen leaves paint the forest floor gold, red and rust, and the soaring purple-blue rocks wear wigs and vests of lime-green moss. .
Is it any wonder that I ended up being a painter? I am so grateful to my humble, cigarette canoe that has taken me to see the remote, secret colours of our grand, Canadian wilderness. How can I not paint them?